CNG: eAuction 133. DIOCLETIAN. 284-305 AD. 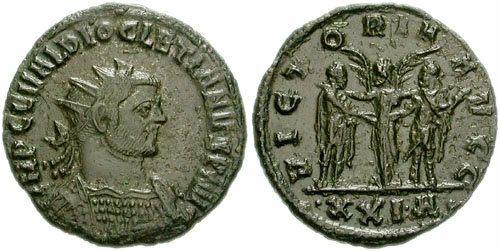 Antoninianus (22mm, 3.63 gm). Siscia mint. Struck circa 286 AD. 133, Lot: 252. Estimate $200. DIOCLETIAN. 284-305 AD. Antoninianus (22mm, 3.63 gm). Siscia mint. Struck circa 286 AD. Radiate and cuirassed bust right / Diocletian and Maximianus extending a hand to each other; Victory standing between, resting a hand on the shoulder of each emperor; .XXI.A. RIC V 281; VenËra -; Cohen 480. VF, a little rough. Rare.